The British Columbia Real Estate Association (BCREA) reports that Multiple Listing Service® (MLS®) residential unit sales in the province rose 6.5 per cent to 5,865 units in October compared to the same month last year. The average MLS® residential price was up 2.6 per cent to $535,695 last month compared to October 2010. “BC home sales rose three per cent in October compared to September on a seasonally adjusted basis,” said Cameron Muir, BCREA Chief Economist. “While consumer demand in Vancouver edged lower last month on a year-overyear basis, strong increases were recorded in the Fraser Valley, Kamloops, Kootenay, the North and on Vancouver Island.” “Total active residential listings in the province declined by 3,360 units in October from September. 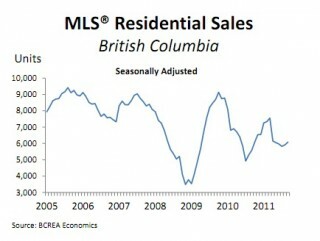 However, active listings were up 6.9 per cent from October 2010,” added Muir. “Market conditions remained slightly in favour of home buyers last month.” Year-to-date, BC residential sales dollar volume increased 16.8 per cent to $38 billion, compared to the same period last year. Residential unit sales increased 3.5 per cent to 66,922 units, while the average MLS® residential price rose 12.9 per cent to $566,925 over the same period.